Three years ago, almost to the day, Maureen Kincaid Speller and I had lunch with Niall Harrison, Jonathan McCalmont and Paul Graham Raven. During the course of the lunch, Maureen mentioned that she was reading Northrop Frye’s Anatomy of Criticism. The upshot was, we decided to read the book together, and take turns blogging about it. The first three parts of this exercise were published on Maureen’s blog, Paper Knife: Maureen on ‘Polemical Introduction’; Paul Graham Raven on ‘First Essay: Historical Criticism; Theory of Modes’; and Niall Harrison on ‘Second Essay: Ethical Criticism: Theory of Symbols’. For various reasons, the exercise ground to a halt at that point. But I have just unearthed my own notes on Fourth Essay: Rhetorical Criticism: Theory of Genres, and thought it worth while presenting them here. Maureen and I have become connoisseurs of filmed plays of late. Worst is the National Theatre, because of the annoyingly patronising introductions by Emma Freud. Best is the Globe Theatre, which trusts us to know how to be playgoers and simply takes us straight into the performance. 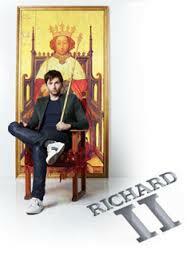 Somewhere in between is the Royal Shakespeare Company, with their first venture into the form in the shape of Richard II, or, to give it its proper title, The Tragedy of King Richard the Second. We appreciated the fact that we were given a full cast list at the start, complete with photographs, a simple innovation that the other two companies should certainly copy. Suzy Klein made a far better fist of the introduction than La Freud, and her interview with director Gregory Doran managed both to avoid sycophancy and to be genuinely informative. However, she also introduces the Proms on Radio 3, and just as always seems to happen on radio she crashed the start of the performance. I don’t know why announcers seem to imagine that the thing does not begin until the first sound comes from the stage. I also don’t know why they feel the need to tell us in advance what we can see for ourselves, or what the play will tell us in the first few minutes. ≈ Comments Off on Are ye fantastical? Will nobody rid me of this turbulent Freud? Last November we went to see a live transmission of the National Theatre production of Timon of Athens. A decent production was all but spoiled by Emma Freud’s patronising introduction, and during the intermission she conducted a dreadfully banal interview with Nicholas Hytner. It was almost enough to make me run screaming from the theatre.